The Samsung Series 3 300V5A pink laptop offers a touch of feminine style alongside a pretty comprehensive specification, resulting in a notebook that is far more than just a pretty accessory. The impressive Intel Pentium B950 processor operating at 2.1GHz, is combined with a substantial 6GB of RAM and a generous 750GB hard drive, operating at 5400rpm. Read on for more details on this notebook in our 300V5A review. Below is our review of the Samsung 300V5A, a 15.6" laptop, featuring 6GB RAM, 750GB hard drive and Windows 7. 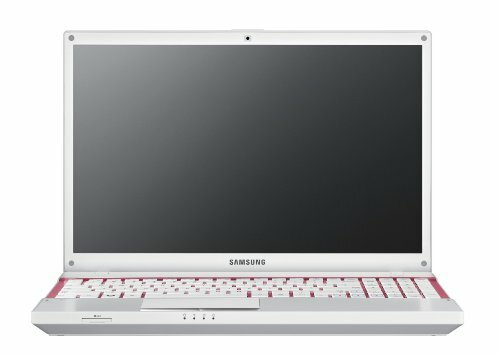 The first thing to point out about this laptop is the colour - pink may well not be to everyone's tastes, and as such this particular colour option may not be for you - if this is the case, then bear in mind that Samsung do a number of other similar laptops which may well be worth checking out. The pink in question covers the lid and keyboard surround in the interior of the laptop - for the record it doesn't look garish - more stylish, albeit a touch feminine. Our testers for the most part liked the design - it's based on the rest of the Samsung range, just with a dash of colour. The rest of the laptop is finished in white, which stands out and gives the impression of minimalism. In terms of size, the 300V5A is 36.7cm by 24cm by 3.2cm, and weighs around 2.45kg - so fairly average for a 15.6" laptop in this price range. The 15.6" screen offers a decent picture, with vibrant colours and crisp visuals - during the test period, none of our tester had any issues with this aspect of the notebook. If you would like to output the picture to an external monitor or TV, then you are able to do so, via the HDMI output. Other connectivity includes a VGA, the aforementioned HDMI, Headphone, Microphone, 3 x USB 2.0 ports, 4-in-1 Multi card reader (catering for SD, SDHC, SDXC and also MMC), RJ45 Ethernet and DC for the power supply. Also fitted is a DVD drive, so you can play your favourite media. The Intel Pentium B950 2.1GHz processor, when backed up by the 6GB of RAM kept the laptop running very fast - multi tasking was handled well, with no visible slowing down. In terms of storage, Samsung have included a 750gb drive, which offered more space than the majority of users will ever realistically fill. The speakers and webcam were both pretty good, offering decent sound quality and picture respectively, which is typical of Samsung's current range of notebooks. The operating system is Windows 7, which is perfectly functional, and worked well during the testing period. So overall what did we think of the pink 300V5A? Pros: A decent specification, works well and looks good. Cons: Depends if you like pink! Older Windows 7 operating system, although this is perfectly functional. Overall the Samsung 300V5A offers a great degree of functionality and computing power at a pretty low price - if you'd like a pink laptop, or know someone who does, then you should take a look at the 300V5A.